I can’t be the only one who occasionally reads back on their own ancient blog posts (and smiles or cringes accordingly)? At some point over the holidays, when I was bored and had nothing to do except eat – don’t you judge me – I was having a scroll back through some of my really, really old posts from back in 2009. I found this rambling piece of rubbish from December 2009, and decided that one of the nail designs in that post was pretty cute (the other one was atrocious, I know) so set about recreating it. Yep, it’s a veeery very simple one but eye-catching nonetheless. I used Illamasqua polishes in Noble and Loella (which is actually on sale for £5 at the moment) and followed the exact same method as I did 4 years ago. Paint about 1/3 of the nail with pink, the remaining 2/3 with blue. 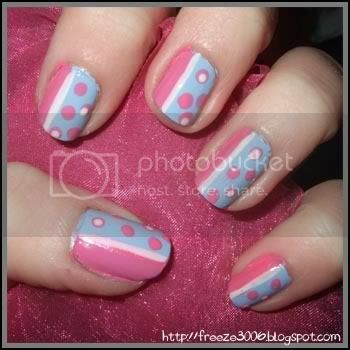 Use a dotting tool to add some pink dots to the blue sections, and add smaller white dots to the centre of some of those. Lastly, divide the line between the two colours with a white striper and add topcoat. Voila! Well, I think it’s safe to say that my hand has definitely become a little steadier since 2009.